We are completely family owned and operated, that means every job is done by the owner Jeffrey Kirk. Jeff has been in the cleaning industry since 1985, and is a Journeyman Textile Cleaner certified by the I.I.C.R.C. (Institute of Inspection Cleaning and Restoration Certification) and is currently working toward Master Textile Cleaner status. We treat each and every home as if it were our own. Just as if you were doing the job yourself, we pay attention to the little things. This means that every job gets a personal touch from a knowledgeable and caring professional so things get done right. We only use safe and proper cleaning agents from the most reputable companies in the industry. We have invested in one of the most powerful truck mounted systems and continue to educate ourselves through I.I.C.R.C. to ensure quality so we can clean the dirtiest carpet down to the most delicate upholstery and do it properly. 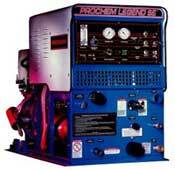 We use a Truck mounted Prochem Legend SE. Powered by an 18 HP Kohler Command Air Cooled Engine, with a Sutorbilt California Legend 3L Blower, and a Cat 3CP water pump. Along with a patented Multi Stage Heat Capture catalytic system with Ultra Temp and Clean Burn. This means that whatever temperature we set it at, it stays at so the soil removal is consistent throughout the job. Clean Burn is a process where the carbon monoxide is re-burned to help create more heat and lower emissions, so you can't smell us, just your clean carpet. With this powerhouse of a machine your carpets will clean better and dry faster than ever before, sometimes in only 1 hour. This machine delivers temperatures in excess of 220 degrees Fahrenheit which makes cleaning a snap, and greatly aids in rinsing so there is no sticky residue to attract new soil and creates the proper surface for the application of new Scotchgard. We use the recommended type of cleaning agents for today's hi-tech carpet and upholstery fabric. Along with an already built in water softening unit in the truck mount, this type of system allows us to clean your carpets and upholstery without any residue. Thus making the carpet and upholstery softer to the touch and ensuring the proper surface for the application of Scotchgard. We never over book our appointments, so each job receives the attention that it deserves. We give exact appointment times, you will never have to guess when we will arrive. We take great pride in maintaining our equipment so our quality is consistent in every home. We believe our image is important and will always arrive in a clean van that you won't be embarrassed to have in front of your house. We take extra care while in your home, and treat it as if it were our own. We never over-wet your carpets, so that they dry as quickly as possible. We take the extra time needed to get your carpet or upholstery as clean as possible and can also offer advice on maintaining your freshly cleaned carpets and upholstery. We use the most modern equipment and a wide range of the safest and best cleaning agents available today to do the job right.